BEWARE of FAKE SELLERS! Treefrogg Apparel (or TREEFROGG) is the EXCLUSIVE owner, producer & distributor of TREEFROGG brand (our logo is on our hat backs). The ONLY name by "Ships from and sold by" should be Treefrogg Apparel. FRAUDULENT Sellers copy & steal OUR photos & descriptions...if you order OUR hats from anyone other than TREEFROGG, you'll receive a hat w/ a GLUED-ON STICKER, or NO HAT AT ALL. SEE BELOW of how to get to TREEFROGG APPAREL's page. TO GET TO TREEFROGG APPAREL...GO TO TOP of the page to Treefrogg Apparel LINK & click on that link. Because these fraudulent sellers have stolen our entire page, this link will take you to ALL of Treefrogg's AUTHORIZED products & you can purchase safely there. We're working w/ Amazon to fix this but in the meantime, these sellers' listings are being allowed to remain active. All Treefrogg items have been custom-designed & embroidered by Treefrogg Apparel in Batavia, OH just outside Cincinnati. 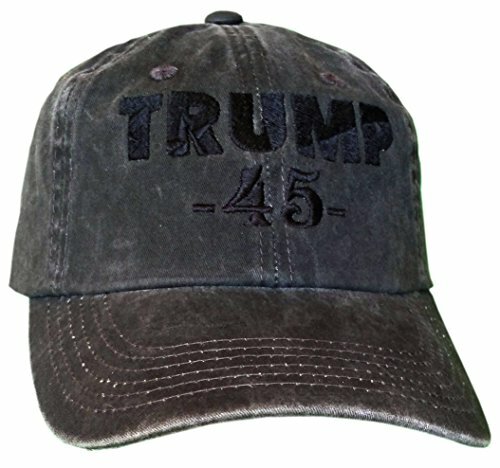 Embroidered in a ONE-OF-A-KIND, BLACK Textured "Trump 45" Design (see close-up photo) ~ "Distressed Black" Hat...Pigment-dyed, 100% washed cotton twill has been garment-washed for that lived-in look. 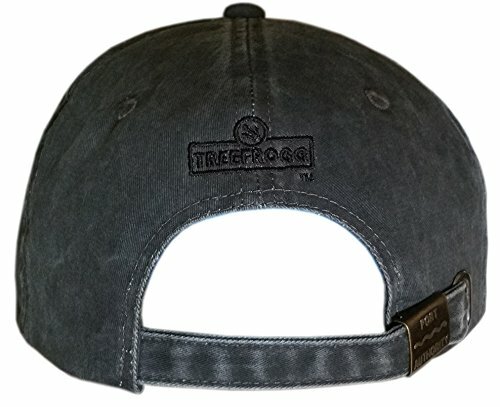 Slightly brushed for softness and comfort; Adjustable Slide Closure w/ Buckle "Treefrogg" brand logo on back of hat in tone-on-tone thread color...a subtle and classy way authenticating your purchase of a Treefrogg hat; At only 3.1-ounces, it's comfortable and lightweight; Low-profile; Unstructured. Adult/Unisex WANT MORE USA-MADE STYLES? YOU CAN HELP! 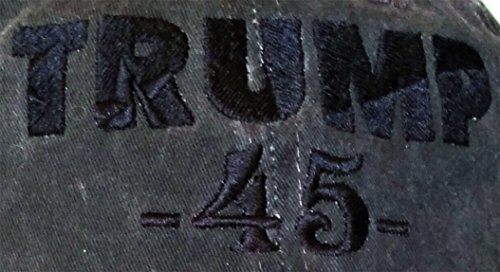 This particular hat is NOT American-made...BUT we want to add as many more USA-Made hats to our inventory as we can. However, many of our popular styles are not available in American-made options.If you ever find USA-Made styles similar to any of our non-American options, please let us know & we'll consider adding it. NOTICE: RESALE OF THIS COPYRIGHTED ITEM, IN ANY LOCATION, IS STRICTLY PROHIBITED. © 2017 Treefrogg Apparel/Treefrogg Specialties, Inc.